Like many of you, the last time my husband and I took a proper vacation was our honeymoon, long before our daughter was born. Whenever I daydreamed about taking a vacation it definitely involved cocktails, sun and someone else making my bed. I will admit that it did not involve any of my daughter’s animated movie characters. Last month my family was invited aboard Royal Caribbean Allure of the Seas to have a preview of their brand new kids’ package, the Barbie Premium Experience. This cruise sounded amazing, especially since it coincided with our daughter Jude’s 4th birthday. And it was a bona fide vacation, so I was sure there would be plenty of sun and at least one pool side cocktail involved. When we arrived at our room the “Special Barbie Guest” sign outside was our cue to press RECORD before opening the door. We secretly hoped there would be a Barbie doll waiting for our daughter and were greeted by a guest package that was beyond our wildest dreams: a Barbie doll with a set of three full Barbie outfits, a tote bag and on the bed was a satin Barbie pillowcase and a plush Barbie throw. And just when we thought there couldn’t be more, in the bathroom was a travel case with a Barbie toothbrush — so much more than we had ever expected! Royal Caribbean’s Allure of the Seas is the largest passenger ship ever constructed and can hold over 6,000 passengers. We quickly realized that the Barbie Premium Experience was only a part of the amenities offered. The ship boasts so many attractions our itinerary was jam packed. The first evening was a welcome cocktail reception with the Barbie Premium Experience organizing staff and senior ship crew members. All of the girls immediately started gravitating towards each other, making easy introductions for all of the parents. We enjoyed cocktails and hors d’oeuvres and I truly felt that each person I met was nicer and more informative than the next. The cocktail reception was highly informative and also highly enjoyable; a nice ice breaker leading into dinner with many of the families in the group. It was the perfect way to kick off the vacation. I learned about the ship’s Adventure Ocean program from the director Cody (the kids call him “Penguin”) which boasts amazing amenities for children ranging from infants to teens. Open from 9:00am all the way until 2:00am (10:00pm-2:00am there is a $6 fee per hour per child), the Adventure Ocean Program is a gorgeous, state-of-the-art facility with separate dedicated rooms for children ranging in ages from 3-5, 6-8, and 9-11. Amenities include a science lab, an arts and crafts room, a theater, gaming rooms with Wii and XBox for older kids and Fisher Price toys, Bumbo and rocking chairs for the little ones, just to name a few! The highly trained, energetic staff was very impressive and spoke a variety of languages so any child would feel comfortable. We were given a cell phone to keep for the duration of the trip in case the Ocean Adventure staff ever needed to reach us while Jude was in their care. That was by far the best amenity. Monday kicked off the first full day of the cruise and we started with the Madagascar Character Breakfast, then we were given a tour of the ship. The spa is definitely worth a visit, even if you forgot to pack your sneakers. There is a gorgeous gym, salon, healthy bar & restaurant. I stopped off at the Vitality Spa Bar on the last day for a green juice (after the week of non stop eating). The staff whipped me up a juice of all the greens they had on hand and it was delicious. It cost $7+, the same as a bottle of apple juice for my daughter! The most important amenity for many kids is the pool deck, boasting separate surf and boogie board simulators, zip line, a basketball court, ping pong tables, the teen club with a lounge and arcade, not to mention the rock climbing walls and ice skating rink nearby. The free frozen yogurt machines near the pool were a major attraction. For the smaller kids there is a sprinkler play area with almost no depth to the water, a pool that goes from 2.9ft to 3.5ft and a small 3.5ft deep “whirlpool” that just spins the kids around. My daughter was fearless in her swimmies and the setup of the pool made it a comfortable way to wind down the days. For those adults whose kids have gone off to enjoy any of these activities, you can escape to the Solarium pool that is for ages 16 and over only. It has its own café where you can spend a relaxing afternoon alone. The Allure of the Seas is the first ship to be built with open space in the midsection which boasts two fantastic ‘neighborhoods’ – the Boardwalk and Central Park. Both had interior facing rooms whose balconies overlooked all the neighborhood action. Central Park is tree lined and has restaurants, cafes and wine and tapas bars. One afternoon we ate lunch at Giovanni’s Table, a family style Italian restaurant. The food was delicious and so plentiful we couldn’t finish anything. Full service from antipasto to cappuccino, and it was all wonderful. The Boardwalk was our home away from home and we were there at least twice every day. The Coney Island themed “boardwalk” has a gorgeous hand-carved carousel that Jude rode at least once a day. There is an ice cream shop, restaurants and the Aqua Theater as well. In the afternoon there were free donuts and hot dogs. 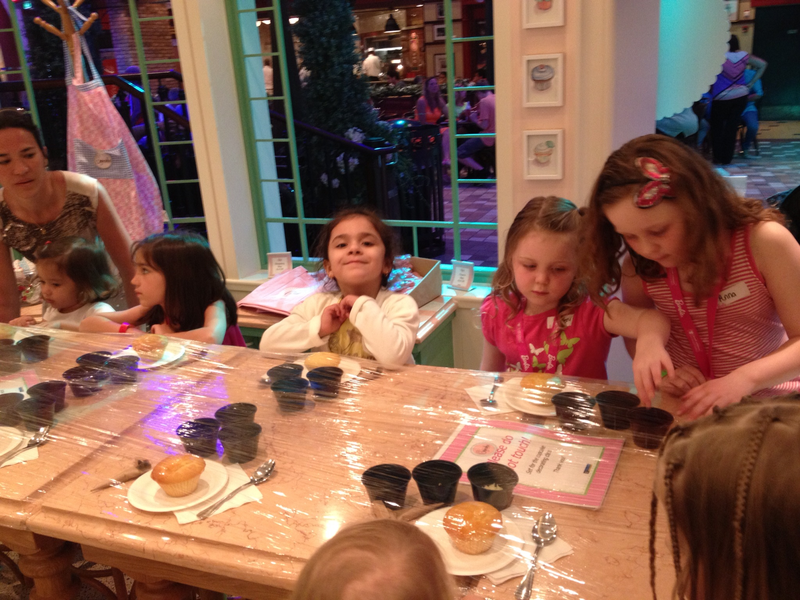 With all of these activities at our fingertips, it was finally time for our first Barbie activity – the Barbie Tea Party. Each girl was given a pink tiara and asked to choose one “guest” (parent) that was invited to sit with her at the tea party. Then the etiquette lesson began. They were taught to serve their guests first and the girls poured out pink lemonade and offered us some delicious pink pastries. As we ate pink napoleons and cream puffs we discovered what a multinational group we were. Girls from all over the world had come for the Barbie Experience – New York, Utah, Toronto, Mexico City, Sao Paolo, London, Dublin and even Sydney! Barbie truly speaks the international language of fun for young girls of any culture. 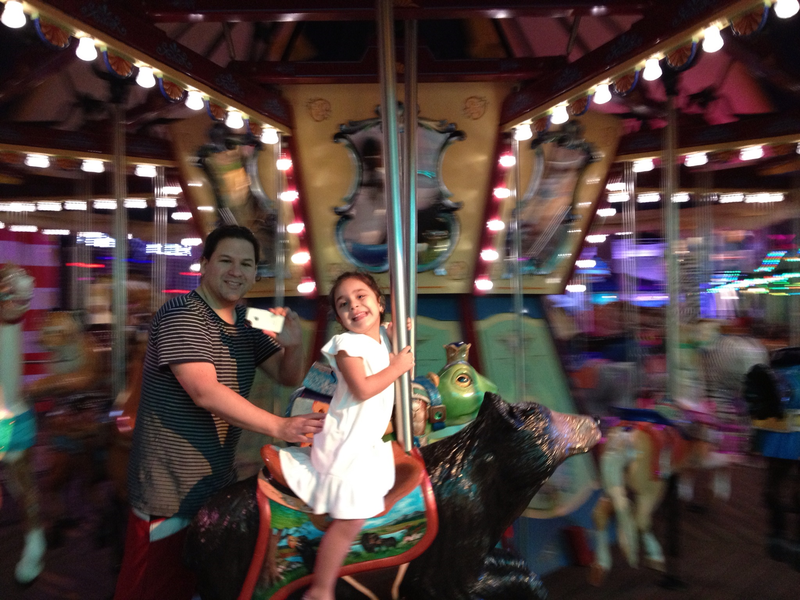 After the tea party we headed to the ship’s Boardwalk for a quick ride on the carousel before dinner. It was no surprise Jude fell asleep before she was even served, but it gave my husband and I a chance to mingle with the other parents. By the end of day one I knew that this cruise was truly a vacation for us all and not going to be just a child-centric experience. A few small tips: when you receive your room card, it tells you your dining room and scheduled dinner seating time. With small children the earlier time may be preferred so be sure to check. Also, we bought a water package so we had water whenever we were in our room or out on an excursion. No matter how much you think you may drink, I wouldn’t suggest getting more than 8 bottles. You can purchase a beverage package at any bar on the ship and the case was delivered to our room. It was truly amazing to wake up to the island’s mountain vistas outside our window. This really felt like luxury cruising at its best. In my honest opinion that was the highlight of Haiti. Disclaimer: I did no research and knew nothing about this island stop ahead of time. Once on land we took a very long, hot walk to the beach, and a local helped us find 3 chairs. Didn’t realize that his help was totally unnecessary as there were plenty of chairs everywhere. It would have been helpful to have been told the park at the Aqua Beach had no rocks and was better suited for children. Nevertheless Jude loved the ocean, we watched zip liners shoot above head and enjoyed a delicious barbeque lunch. There was a very distinct difference between the island locals and the Royal Caribbean staff and it made me appreciate the overly extended hospitality that the ship’s staff provides. The island’s activities were certainly geared towards older kids and teens. Our 4-year-old could not participate in anything: water slide was 7+, the Aqua Park was a group of huge inflated toys floating out in the ocean and she was also too young for the roller coaster. It was nice to get off the boat and see the beach but Labadee was not for me. Tuesday was our second Barbie activity, the Barbie Fashion Experience. The girls got to design an actual outfit for their Barbie to wear to the fashion show on the last day. I initially thought this activity may have been geared more towards the older girls of the group but I was surprised how my 4-year-old was able to keep up. We watched a video about a fashion designer who makes clothes for Barbie and the girls sketched out ideas before working with real materials. The fashion kits are available in stores and their ease of use would make them excellent gifts for any girl who loves Barbie. My daughter used stencils to decorate her dress with hearts, attached the self adhesive ruffles and bows and had made a dress ready for the runway! Afterwards we were treated to a cupcake decorating class in the cupcake shop, where all the girls got to make cat cupcakes. Everyone enjoyed the professional-looking cupcakes and we all went home with some fantastic tips! We stopped for Starbucks and got Jude some free pizza before running to change for a show and then dinner. The Ocean Aria Water Show is not to be missed. “This is amazing!” and “I want to do that what I get big!” — the two things every parent loves to hear when they expose their children to something new. By day three we are getting to know the other families and participants really well and socializing had become just as fun as the activities. I’m certain that if we were not part of the Premium Barbie Experience my daughter would not have formed friendships with this many other children and my husband and I certainly wouldn’t have been socializing with other couples. The port in Jamaica was totally Americanized; Quiznos, Nathan’s and tons of jewelry shopping. Our excursions were to a working plantation, to a small resort for lunch and then to the Dunn’s River Falls. We had an excellent tourbus guide who told us all about local “parishes” where Usain Bolt, Harry Belafonte and ‘Robert Mr. Marley’ were born, and traditional dishes like goat belly soup served at weddings and funerals. Yeah mon. We had a fantastic time at the Brimmer Hall Plantation that made the long bus ride worth it. The warm staff greeted us with ice cold drinks and we all boarded tractor-pulled jitneys and took a short tour of part of the 2,000-acre plantation. For this New Yorker everything was so interesting: banana trees — we learned that the trunk of the tree peels like an onion and the heart of the trunk is surrounded by a thin, thready-fabric that they use to make wigs, stockings, etc. Acai plants — if the plant is closed it’s poisonous but if it’s open it’s fine to eat. We smelled all-spice leaves, lemon leaves and returned to the main house to taste deliciously juicy Jamaican apples (tastes like a pear married a plum), coconuts with raw sugar and pieces of sugar cane. Yeah mon! Lunch was delicious at a small resort. Best part was the rum punch for the adults when we walked in! The Dunn’s River Falls were beautiful but too dangerous for kids under 5 to climb, but we all enjoyed the cool, crisp pools. Even the youngest babies loved the water and didn’t want to leave. The rock floor was brutal so bring your water shoes and a towel — everyone leaves soaking wet! Fun, helpful guides, lots of songs and they even take video of you in the Falls. To end this jam-packed day, we stopped to see the How To Train Your Dragon Ice Show before dinner. Jude loved it and was at the edge of her seat the entire time. I do enjoy having a show to see before dinner — it makes the night seem fuller and I don’t feel as guilty falling asleep by 10:00pm. Despite the overcast, cold weather and closed beaches due to rough water, I certainly had the most fun in Cozumel. It was only a short bus ride to the water park resort where the kids played all day in the huge shallow sprinkler area. The adults enjoyed the first open bar of the trip. All around it was fantastic. 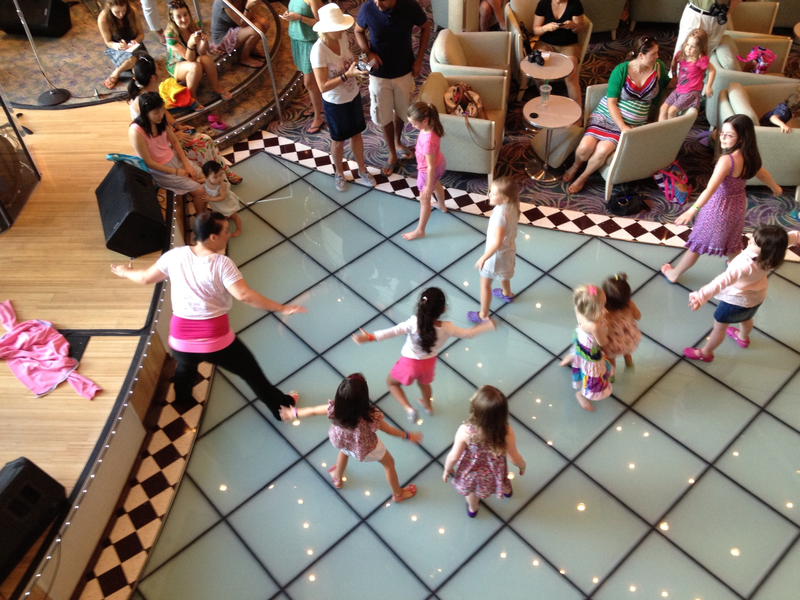 Back on board we prepared for the Fashion Show grand finale with a rehearsal Barbie Dance Class. Led by one of the Adventure Ocean staff who was a dance instructor, the girls learned a fully choreographed routine to the song “Do The Mermaid” from Barbie in A Mermaid Tale 2 movie. The workshop was very professionally run and we were all thrilled to see the girls immediately catch onto the moves within the spam of one hour. My daughter was anticipating the fashion show all week but now we were even more excited! But before the big event we still had more activities. The Barbie Sing-Along was karaoke songs from various Barbie movies. For the younger girls who couldn’t read lyrics this event was not as engaging. Still the girls had fun playing with each other and their glittery toy microphones and for those who had seen the Barbie movies featured it was even more engaging. Straight from the sing-along Jude willingly went to dinner with the Aquanauts and then headed back up to the Ocean Adventure play room. When we went to pick her up for the Family Dance Party she didn’t want to come with us! She chose to stay with the Aquanauts so my husband and I enjoyed a cocktail and dinner. When we picked her up at 10pm, she was already asleep. 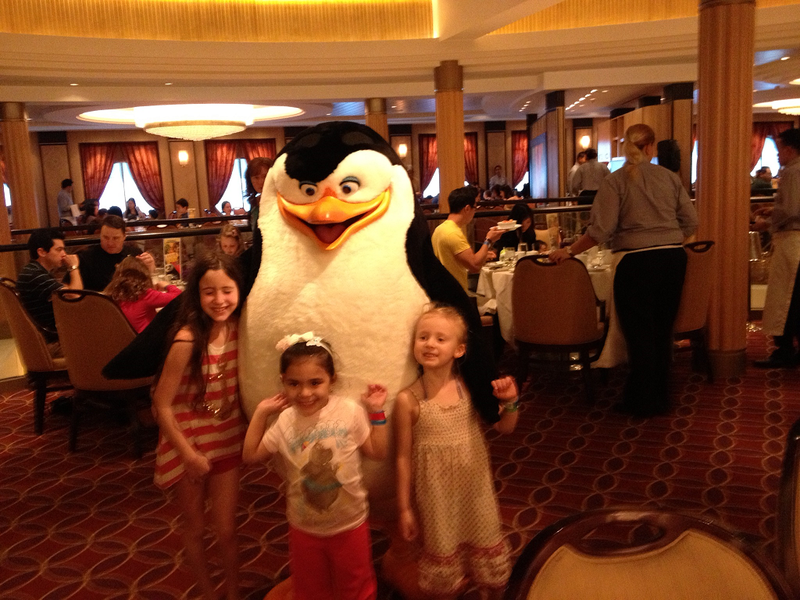 On our final day of the cruise we had a jam-packed schedule but most importantly it was our daughter’s 4th birthday! There is no way to sum up the amount of celebration that was had. I can’t imagine how we could ever top this birthday. The day started with a Dreamworks character breakfast with all of the characters we had missed throughout the week (Po, Mort and the Penguins). They sang a birthday song for Jude and she was thrilled. The focus of day was the evening’s Barbie Fashion Show. But before the girls were treated to a surprise complimentary manicure (not part of the package), we had so many exciting activities planned. And at five o’clock, with the red carpet rolled out in the Dazzles Lounge, the Fashion Show began. It felt so professionally put together. Girls walked the runway in their tutus and accessories, posing and really showing off their own individual styles. The grand finale was the Mermaid Dance they had all practiced and it brought the house down! The show was AMAZING (as you can see in this video) and for me it was the highlight of the trip. 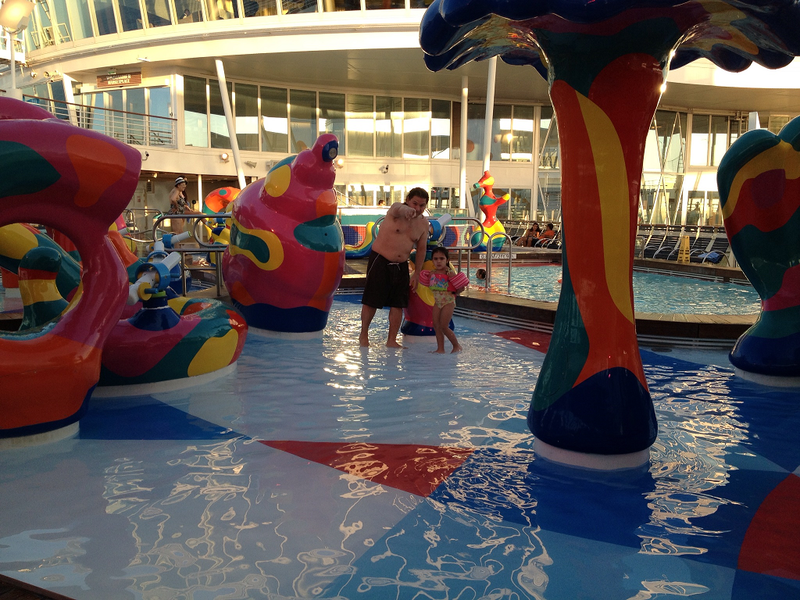 Our week on Royal Caribbean and the Barbie Premium Experience from Rob Burgos on Vimeo. The last night was the Dreamworks Parade extravaganza. It was so much fun and felt like the whole ship was there. Captain Johnny rode out in his motorcycle – it was awesome! We ended the night with our new group of friends at dinner. The Barbie Premium Experience staff had arranged for a huge pink birthday cake for our daughter and, together with the wait staff, we all sang happy birthday. It was the perfect ending to a perfect week. There were so many wonderful elements to this trip — the Barbie Premium Experience, the ship and the cruising experience, the friends we made and the laughter we shared — it was all truly priceless. In the morning as we walked to our room for the last time my daughter was crying, saying she didn’t want to leave the ship. We told her not to worry, we would be back soon.